As petabyte (PB) growth continues to increase at a rapid pace, corporate and cloud data centers are under extreme pressure to improve the efficiency of storage. To address this data center challenge, HGST introduces Ultrastar® 7K6000, delivering up to 6TB of capacity in an industry-standard, 3.5-inch hard drive, for capacity-optimized enterprise applications. Ultrastar 7K6000 provides 50% more capacity and 30% better power efficiency in terms of Watts per terabyte (W/TB) than its predecessor, Ultrastar 7K4000. The 7K6000 is designed for all traditional and rapidly growing scale-out storage applications, including object, block and file storage architectures, providing huge capacity, the fastest 7,200 RPM performance and the best $/TB acquisition cost. Ultrastar 7K6000 also delivers greater storage efficiency through best-in-class performance, achieving up to 3X higher random write performance, thanks to HGST media cache architecture, a disk-based caching technology, which provides a large non-volatile cache on the disk. Media cache also allows for improved reliability and data integrity during unexpected power loss. Other performance-enhancing features include higher areal density for 25% faster sequential performance vs. 7K4000, and a 128MB cache buffer. The 7K6000 offers a 12Gb/s SAS (6Gb/s SATA) interface for easy integration into high performance data centers. As drive capacities increase, so does the time required to recover a failed drive in a RAID configuration. Dramatically reduce RAID rebuild times and maintain system performance during the rebuild process with the new Rebuild Assist. Learn more in our Rebuild Assist technical brief. Compliance and privacy requirements drive the need for increased data security. Ultrastar 7K6000 helps protect data from unauthorized use by offering security and encryption options. Instant Secure Erase (ISE) models expedite drive redeployment and retirement. Encryption models protect data with hardware-based encryption, including a Trusted Computing Group (TCG) Enterprise_A, TCG with FIPS 140-2 certification, Level 2. 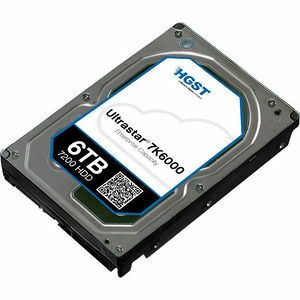 The Ultrastar 7K6000 is a seventh generation, 5-platter design, field proven by top server and storage OEMs, and Internet giants, and extends HGST's long-standing tradition of reliability leadership with a 2M-hour MTBF rating and a 5-year limited warranty.